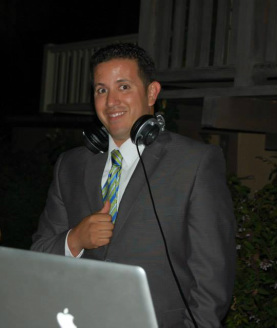 DJ Jerry Rodriguez, born and raised in Santa Barbara, has been a professional Disc Jockey for night clubs and events for over 14 years. Being raised as the son of a musician, he was always attracted to the way music could make an event come to life. Jerry's vast experience as a nightclub/ bar & event DJ, coupled with his latino background, make his ability to seamlessly blend between genres effortless. He has played all over Santa Barbara clubs and bars including such places as but not limited to: The Study Hall, Sandbar, Indochine, Tonic, Omalleys, Savoy, Statemynt & Sharkeez. Although the nightlife is essential in any dj’s career, Jerry’s true passion lies in performing at a wedding or private events. It is here where he can tailor the music to reflect your personality while providing all of your guests a memorable experience as well.